We are living in a unique time in history. Social media and information technology have given everyone access to power, knowledge, and a platform—things that once belonged only to kings and queens. Journeying through the life of David (a king after God’s heart), Age of Kings addresses the issues of our social media age: personal propaganda, #hashtivism, acquaintance-friendships, trolls, selfies, desire, cognification, and fake news. Like a guidebook for the newly crowned kings and queens of this age, Age of Kings equips the reader to discover their true worth and identity, to conquer giants, to experience true friendship, to share their life authentically, to give all glory to God, to walk in sexual wholeness, to embrace humility, and to seek truth in community. 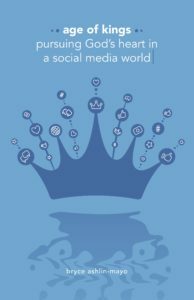 This book explores, richly, beautifully, compelling, an intriguing idea: that the explosive growth of social media has put into all of our hands, literally, the kind of power and knowledge that once only royalty had. We can destroy a life with one Facebook post. We can disrupt massive institutions with a single tweet. We can reach audiences around the world by just pressing send on Instagram. Bryce Ashlin-Mayo isn’t denouncing any of this. But he is calling for wisdom. But even better – he’s providing such wisdom. This book, urgently needed, is so clear and helpful that anyone who reads it will learn how to use their regal power to do good, and not to harm. In Age of Kings, Bryce gives us a fresh take on the life of King David that meets the needs of today’s social media culture. Sharing compelling stories and rich insights, Bryce reminds us that we can find answers to the questions of our present and future by diving deep into the biblical stories and metaphors of our past. A valuable read to navigate our current culture well! This book is nothing short of brilliant in its analysis of how the world of social media can, paradoxically, both control its users, and yet give them a sense of empowerment at the same time. Thankfully, it is equally brilliant in its use of the biblical narrative of King David to articulate how the user of social media may wisely, safely, and righteously live in that world. The author’s heart and concern for his readers come through clearly. It is delightfully written, and I have learned a great deal from it. I recommend this book highly. For those wise enough to engage it, Age of Kings provides a rare, skillful, and fruitful blend of cultural and biblical analysis. In the face of the seeming tangle of opportunities and challenges provided by the emerging social media culture, Ashlin-Mayo draws on the stories of Israel’s King David to deliver to contemporary readers both biblical perspective and godly direction in their attempt to navigate well the tricky terrain of this brave new world. This well-written and approachable volume will serve as an invaluable resource for everyone who desires to live faithfully in the emerging and ever-shifting digital world. What does it mean to follow Christ in our social media age of Facebook and Twitter? In Age of Kings, Bryce Ashlin-Mayo offers us a wonderful answer with biblically grounded reflections on the life of David enriched by the wisdom of Solomon. An indispensable resource! The Swedish Atheist, the Scuba Diver and Other Apologetic Rabbit Trails. Bryce clearly engages the intersection of scripture and culture with winsome skill. This timely, excellent release is full of rich insights, cleverly explored. I'll buy copies for my youth leaders, as well as my own teenagers, since I'll be greedily clinging to my own. I recommend it 10/10! Age of Kings: Pursuing God's Heart in a Social Media World will guide you in the always-changing terrain of social media. This is a practical, helpful, and engaging guide for any age and I found myself highlighting early and often. Dr. Ashlin-Mayo sums up his work with this quote, "As followers of Jesus, may we stand tall and reach further, running on mission together, empowered by the opportunities and abilities that social media provides." A solid read! In Age of Kings, Bryce Ashlin-Mayo weaves stories of kings and queens, giants and warriors, and even trolls, into a vivid tapestry picture of all our journeying through an increasingly complex and treacherous digital world. The book is elegantly written while paradoxically packing a visceral punch. Best of all though, Age of Kings calls every Jesus-formed man and woman to live out their divine calling faithfully, and with pastoral care Bryce provides wise and biblical counsel in how to do so. In the Age of Kings, Dr. Ashlin-Mayo invites us to re-imagine the way we (as Christians) engage social media. Through rich metaphors and unique insights we are reminded of the fictions we tell about ourselves that are enacted and promoted through the selective editing of our lives on social media. The solution may be challenging, but his antidote better enables us to use the tools God has given us for good. ---- Thomas Ingram, author of The New Normal. When it comes to social media, many use it, but few have thought through it. Bryce writes on a subject with theological depth, sociological astuteness, and insight into the Bible, culture, and the human heart that is so timely and needed. Age of Kings was a fascinating and intriguing read. Throughout, Bryce gracefully moves from our absorption with social media to the ancient world of Kings and Queens. His premise is that the same power that once was the exclusive domain of Kings, now lies with anyone owning a mobile device or computer. It’s been democratized. In a balanced way, Bryce then offers timely lessons from the life of David that help us to not only understand technology’s capacity for good but to offer practical insights and tools to check its excesses and temptations. This book will prove invaluable to anyone wishing to better steward the power of social media. We live in a world of growing digital social engagement accompanied by an equally growing amount of loneliness, depression and isolation. The typical response to such a sad situation by the people of God has often been either condemnation or apathy. Bryce in this powerful book chooses to take a third approach: redemption. If the modern day Church is unable to change the digital revolution happening around us at breakneck speed, then the best option is to find a way to see God’s grace in it. This book is a refreshing look at the ongoing parallels of our day and the people and context of scripture. It should be in every thinking leader’s hand.